(1) Integrating 50% of the sales of AgReliant (North America. Field Seeds). Taking into account application of the standard IFRS 11, certain companies have been accounted for using the equity method since fiscal year 2014-2015. By the year 2050, food production will need to be increased by 70%, in order to feed almost 10 billion people and thus meet the needs of the world’s growing population. It will therefore be necessary to produce more, but also produce better in a context marked by the erosion of arable land. Vilmorin & Cie’s ambition is to contribute to meeting world food challenges by developing more efficient seeds (yield, disease resistance, better adaptation to different climates and regions, etc.). 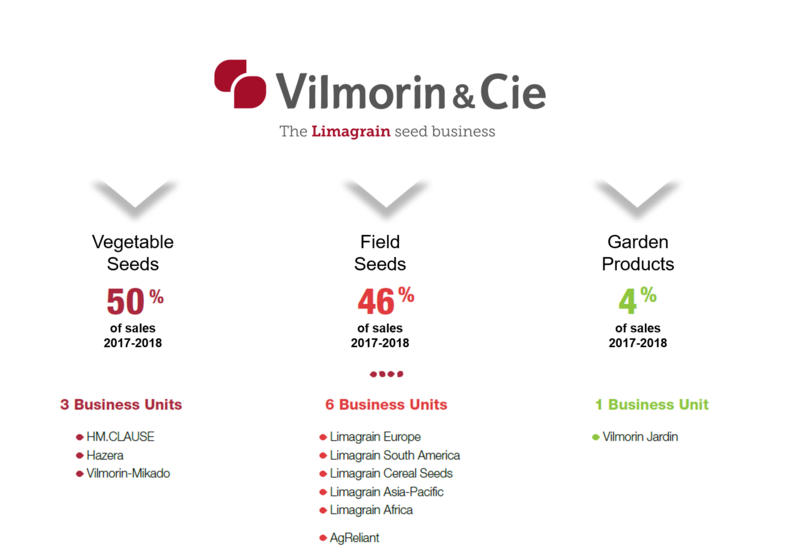 Vilmorin & Cie is one of the world leaders of the seeds sector. It develops business around three activities, two of which represent its core business: vegetable seeds and field seeds, along with the garden seeds activity. As No. 2 worldwide for vegetable seeds and No.6 worldwide for Field Seeds, Vilmorin & Cie relies on sustained investment in research and a strong international development strategy to sustainably strengthen its competitive positions. Vilmorin & Cie’s development model relies on three major, singular advantages: a single core business of seeds, close proximity to its markets and a long-term vision of its development. This development model draws strength from the fact it adheres to three founding values, shared with its reference shareholder Limagrain: progress, perseverance and cooperation. It is also founded on more than 275 years of prestigious history dedicated to plant improvement. Vilmorin & Cie is a pure play seed company and is not involved in agro-chemicals. From research to distribution the company is active in all stages of the value chain, proposing high quality seeds, perfectly adapted to each of its target markets. Each of Vilmorin & Cie’s activities is organized in Business Units, guaranteeing greater proximity to its customers and target markets. This model provides excellent knowledge of a market that is highly segmented in terms of products and geographical influence. It guarantees Vilmorin & Cie with an excellent capacity to anticipate and to respond. The long-term is central key to a seed company since on average it takes 7 to 10 years to create a new seed variety. Vilmorin & Cie’s long-term vision is strengthened by the consistent accompaniment of Limagrain, whose culture and governance model encourage lasting strategic choices.